She was Lyra in Philip Pullman’s His Dark Materials at the National, she has shared the stage with Eileen Atkins (in Honour and The Female of the Species), played Isabella in Measure for Measure, Regan in King Lear and Sally Bowles in Cabaret. She has worn bonnets in Bleak House and North and South, a corset as Elizabeth Darcy in PD James's Death Comes to Pemberley (pictured below) and a prison officer’s uniform in Accused, a gritty Jimmy McGovern story on television. 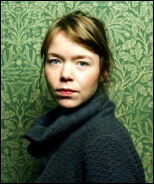 An enviably versatile actress, Anna Maxwell Martin has won two BAFTAs (for Esther Summerson in Bleak House and N in Poppy Shakespeare) and been nominated for an Olivier (for Lyra). If you have a link Anna related please feel free to send it to us at annafansite@gmail.com and I'll add it to this page. My name is Hayley I'm the blogger/creator of this little website dedicated to Anna Maxwell Martin, I created a site way back 2006 then it was called Anna Maxwell Martin Fan, unfortunately I was a poor poster and the site went into hiatus for a long period, I resurrected it way back in July 2008 and moved over to blogger again my posting has been sporadic but I'm going to focus more on the site this year. Anna is one of my favourite actresses ever since I saw her in North and South and then again in Bleak House I thought she was very talented and I was sad to see no site dedicated to her work so decided to create one myself, I hope you like the site and look forward to Anna future work. Welcome to Simply Anna the first unofficial fansite dedicated to the talented british actress Anna Maxwell Martin, open since 2006, it's the first stop to bring you all the latest news. This Fansite is 100% unofficial and is not affiliated with Anna Maxwell Martin or management this is simply a fansite run by fans for the fans, no copyright infringement is intended, if you have any issues with anything on here please contact me at annafansite@googlemail.com.